Star Wars Battlefront 2 has a lot to prove. Years of Star Wars games being released with varying degrees of quality left the franchise with a feeling of unpredictability. After the cancellation of Star Wars 1313 created a gaping hole in terms of new stories to play through, fans are understandably hungry for the next great adventure in this galaxy far, far away. As the first major Star Wars campaign since EA’s acquisition of the license in 2013, Battlefront 2’s story needs to right the ship. After getting a few hours of hands-on time with some early story missions, I‘ve grown confident in Battlefront’s ability to restore balance to the force. Battlefront 2’s campaign nails that Star Wars feeling. The team at EA Motive has shown a tremendous amount of care and dedication into making it feel like the universe that fans have known and loved for years. From little sound effects like the joyful yelling of Ewoks swinging above to the décor of a Rebel cruiser’s white paneled corridors, there’s a great attention to detail in making it feel familiar. Even the gameplay elements take cues from classic moments in the series – shooting a door panel on the wall will cause the door to close, for example. It all feels and plays authentically like Star Wars. Despite not having a campaign of its own, the multiplayer suite of 2015’s Star Wars Battlefront already laid the foundation for a strong shooter experience. That same experience drives Battlefront 2’s campaign. It’s a slightly slower-paced and less precise shooter, but to its own benefit; it’s less of a run-and-gun campaign a la Call of Duty and more of a sci-fi adventure that paces the action perfectly for the more “fun” universe it’s set in. Much like its multiplayer, the Battlefront 2 campaign is built around three gameplay tenets: on-foot shootouts, ship-to-ship dogfights, and the empowering heroes that fans are familiar with. The three missions I got to play through only featured two of those – I still haven’t seen any of Battlefront 2’s 14 playable heroes show up in the campaign – but the moment-to-moment excitement should feel reminiscent to those who have already experienced the series’ multiplayer. The same weapons, abilities, and customizable loadouts (the Star Card system is present in multiplayer as well) run through the veins of story mode. The biggest standout of the few hours I played came from the compelling story. The thirty year gap between Return of the Jedi and The Force Awakens is a mostly unexplored period in the new Star Wars canon, an aspect that appealed to the designers at EA Motive. We’ve all seen the Rebel victory on Endor and the destruction of the second Death Star, but what happens the next day? How do the remaining Imperials pick up the pieces and move on after their second super weapon is blown up, and their emperor killed along with it? Motive aims to tell a more personal narrative about how a lifelong Imperial must come to grips with this loss. Protagonist Iden Versio has so far proven to be a gripping, entertaining character; she’s a no-nonsense, devoted Imperial who has never known a life outside of loyalty to the Empire. She is quite literally a poster child for what it means to be an Imperial – her face is actually plastered onto Imperial propaganda throughout the galaxy. To go into detail of what I’ve seen of her early emotional journey so far would spoil some of the fun, but suffice to say, Iden’s world is turned upside down the moment she realizes that the Empire isn’t the omnipotent presence of authority she thought it was. Battlefront 2’s first level shows how skilled and loyal of a soldier Iden truly is. As a prologue mission taking place shortly before the events of Return of the Jedi, Iden finds herself captured aboard a Rebel cruiser and interrogated for information. The soldier remains silent, however, and is soon revealed to have been captured intentionally in order to secure Rebel documents on board. As Iden secretly passes her location to her miniature probe droid, I was able to control the droid and sneak through the halls of the ship in order to free Iden. Loose and soon armed, this prologue mission demonstrates some of the stealth mechanics of the campaign, like the ability to silently take out enemies from behind at close range or from a distance by sending your droid to shock them. The remainder of the mission is a combination of sneaking around undetected and full-on hallway gunfights that leads to a daring escape from the cruiser. This same combination of stealth and action carries over into the next mission, the Battle of Endor. After the shield generator on Endor is destroyed, Iden and her fellow members of Inferno Squad are sent to take charge of the situation on the forest moon. Now accompanied by her two squad mates, players can choose to take out enemies silently or go in guns blazing as they make their way towards Rebel camps. Not long into the mission, the events of the film take place – Iden looks up into the sky to see the Death Star destroyed, and with it her notions of the Empire’s power and arrogance are questioned for the first time. It shows a new side to Iden not yet seen up to this point; one of confusion, shock, and doubt. It’s a compelling twist of fate, and one that will seemingly carry throughout the rest of Iden’s story. As Inferno Squad grasps with the reality of what just occurred, they decide that retreat is the best course of action until they can regroup with the Imperial fleet. This leads to a large scale battle with Rebel soldiers guarding a landing platform that is home to a few remaining TIE Fighters. Armed with blasters, grenades, and a rocket launcher, the most chaotic firefight seen so far culminates in a battle with a small army of Rebels, including a stolen AT-ST walker. I eventually made my way through the thick Rebel forces, stole a TIE Fighter, and – after a brief, but awe-inspiring section where I flew my fighter through the Death Star’s debris – was able to rendezvous with my team and what was left of the Imperial forces surrounding Endor. The final mission I played, known as “The Dauntless”, picks up some time after the defeat on Endor. Details of a confidential new Imperial plan known only as Operation: Cinder have come to light, although details are scarce, even to Iden. 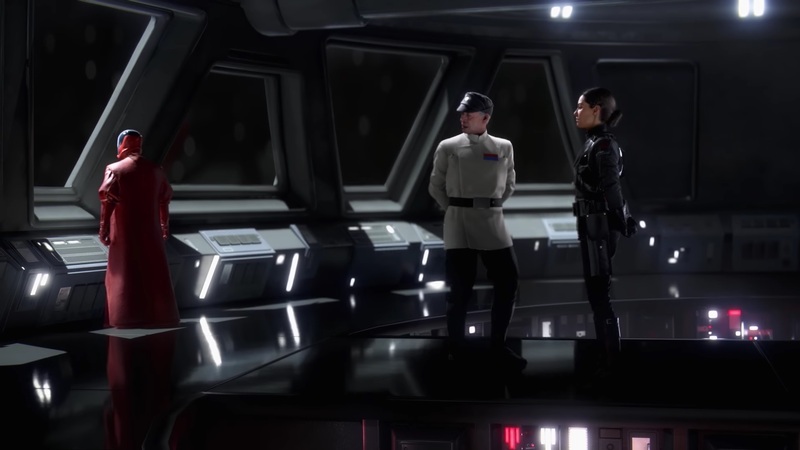 It’s here that we meet Admiral Versio, Iden’s father, who is just as staunch and stoic, but with far more experience than his daughter. Despite not even knowing any details outside of the existence of this new Imperial recovery effort, Iden is forced to continue her missions as before with nothing but blind faith that the Empire is doing what is necessary for the galaxy. The mission begins as it’s discovered that a fleeing Rebel fleet has stolen crucial information from a nearby Star Destroyer orbiting the Imperial homeworld of Vardos. Piloting a TIE Fighter, Iden must fight off Rebel X-Wings while chasing an escaping Blockade Runner. Stopping the Rebels before it’s too late gave this mission a sense of urgency unlike the other levels I had played so far. Faster-paced and more action heavy, this mission quickly transitions between space combat and on-foot warfare as Iden boards the Rebel ship. It was a thrilling sequence that once again demonstrated Iden’s unwavering dedication to the Empire even after their greatest loss ever. I concluded my gameplay session with Star Wars Battlefront 2’s campaign feeling relieved. As a lifelong fan of the films, playing through the events of Return of the Jedi from a new perspective felt like a great concept while still handled with the utmost care. Iden is a great character so far, and I can’t wait to see where her story takes her. Battlefront 2 is as distinctly Star Wars as you can get and my wait for November 17th just got that much longer.